A popular 19th-century backyard game that became a sport and then all but died out is enjoying a renaissance. What on earth is gorodki? Why is it so addictive? And what skills does it develop? The gorodki player gets ready to throw. The wooden bat in his hand looks just like a normal stick. The playing area in front of him is lined with pins set out in bizarre shapes. He throws the bat… a clatter, and some of the pins end up behind the line of the square drawn out on the ground. To understand gorodki, you first need to know the terminology: The word gorod means "city," while gorodok means "small town" or "village." The aim of the game is to knock the five cylindrical pins, or "villages," out of the "city" (that’s what the square-shaped playing area is called) in as few throws as possible. The "villages" are 20 centimeters long and about 4.5–5 centimeters in diameter. Players stand 13 meters – a "con" – from the "city" and throw the stick. If they successfully knock one or more of the pins out of the "city," then they continue to throw from a distance of 6.5 meters ("half a con"). A village is considered "banished" when all the shapes have been knocked out of the square-shaped playing area. The shapes are arranged into configurations with names such as "cannon," "fork," "star," "crawfish" and "airplane." The player who uses the least amount of throws to knock out all 15 shapes over the course of three rounds wins. Gorodki can be played one-on-one or in teams. In gorodki, the playing area is a 2 by 2 meter square divided into zones where the players aim their shots. The bats used by the players to break up the figures are usually made from oak, hawthorn or dogwood, and they cannot be longer than one meter. Players receive no points, have the villages re-set and are charged a turn if the bat touches the line or the ground in front of the line; if they step on or over the boundary line; and if they do not throw the bat within the designated 30-second time limit. Gorodki was invented by Russian peasant farmers, who would etch out a playing area in the ground and then knock wooden figures down with bats made from the very same wood. Concrete and asphalt playing areas didn’t appear until much later, in the 20th century, by which time the bats already had iron sections on them. In 1928, gorodki was included in the All Union Olympics. And the official rules, which still govern the sport today, were finalized in 1933. The number of configurations was fixed at 15. The 1960s and 1970s were the golden years of gorodki in the Soviet Union. 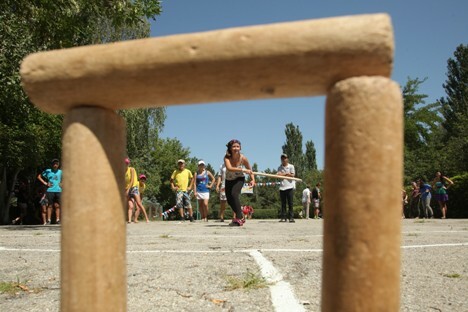 Every stadium, vacation retreat, health spa, courtyard, summer camp, plant and factory had its own gorodki playing area. But interest in the sport began to wane, until the 1990s, when it experienced a revival of sorts. The International Federation of Gorodki Sport was established, with Belarus, Estonia, Finland, Germany, Latvia, Moldova, Russia, Sweden and Ukraine as its members. Many famous people have tried their hand at gorodki over the years, including writers Leo Tolstoy and Anton Chekhov, Soviet leaders Lenin and Stalin, scientist Ivan Pavlov and singer Feodor Chaliapin. President Vladimir Putin, Moscow Mayor Sergei Sobyanin and Russian Minister of Sport Vitaly Mutko have all been caught playing gorodki themselves. Unfortunately, not every Russian city has a place to play gorodki or coaches to guide young talent. And the fact is that many people simply do not know that such a game even exists. Practically every gorodki player today came to the sport thanks to friends or relatives. Priozersk player, Daniil Mayerovsky, first tried his hand at chucking the bat when he went to one of his friend’s training sessions. It was chance that brought Tomashevich to gorodki as well. It’s not just professional coaches that are trying to get the word out about gorodki; ordinary people are getting involved as well. Gorodki is never likely to pose a threat to soccer or tennis in terms of global popularity, but its support base is growing at a steady pace. Gorodki playing areas will be appearing all over Moscow this summer, with the first one opening at Bauman Gardens on May 18th.